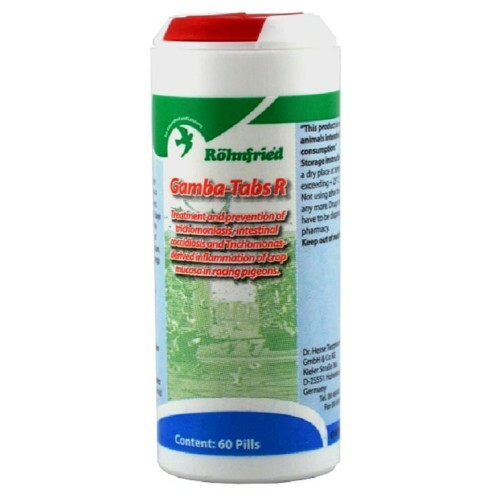 Gamba-Tabs R 60 Tablets - 3 in 1 - by Rohnfried is one combination of tablets with five active ingredients against trichomoniasis/Canker and coccidiosis. This individual treatment for old and young pigeons is sure to prevent performance breakdowns during the racing season. Gamba-tabs is also ok for respiratory. • During racing season, 1 tablet per pigeon at the beginning of the week every 8-14 days and 1 tablet for each squab when weaned. • Treatment: 1 tablet per pigeon 2-3 days in succession, depending on the severity of the infection and, two weeks before the first brood hatches, 1 tablet per pigeon 2 days in succession. Administer 1-2 hours before feeding! Dropping may show a slight yellow colouring.